Sometimes I’m just too lazy to cook. I’m up early in the morning, work a long day, do a bit of cleaning, catch up with the never-ending task of laundry/folding/dusting/wiping walls/ironing, tend to my little garden… and by the time I know it, it’s late in the day and I’m tired. And cooking? Heck. No. Sound familiar? I have a feeling I’m not the only one who’s like this. Sometimes life just gets in the way of making a healthy meal. In my old days, when I was the pasta queen (seriously – I had one shelf in my cupboard dedicated to pasta), I would open a box of Barilla and a jar of Classico. 20 minutes and a bit of fresh shaved parmesan later, voila! Dinner was served. Now that I know that food was what was killing me, it’s no longer an option. Eggs are a good go-to. But… I sometimes tire from having eggs too much in my diet – I eat a few (ahem. 3.) a day for breakfast. Anyway, enough of that. Here’s what I do when I’d rather not be cooking or whatever. In a medium-sized skillet over medium heat, melt the lard or butter. Add kale and garlic and cook until kale is wilted. 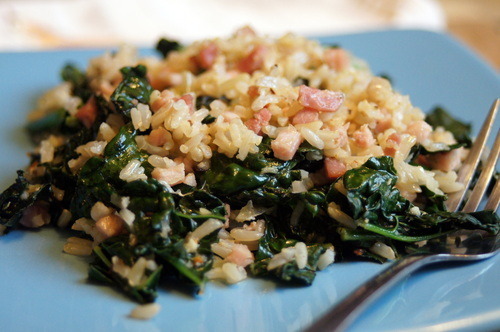 Add cooked sausage or ham and rice and stir to incorporate. Mix in spices and cook until warmed through. 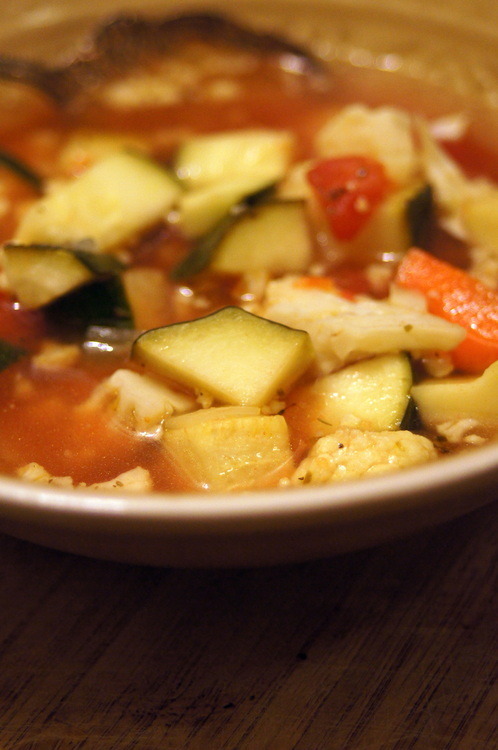 For dinner: Serve with steamed veggies and some sauerkraut. 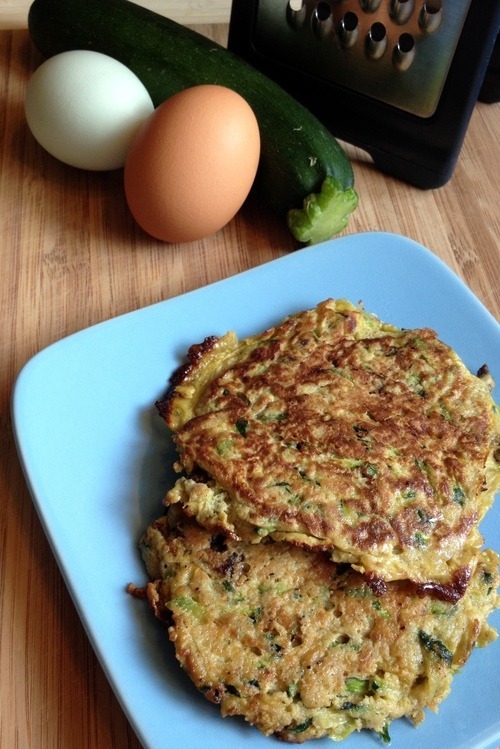 For breakfast: Serve with eggs and some sauerkraut. 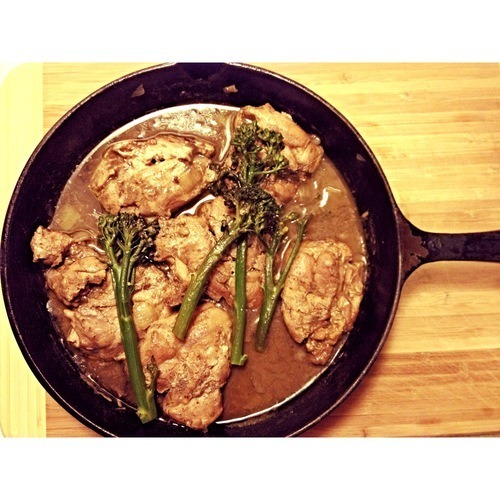 By far my favorite chicken recipe of all time, this used to be my go-to when I had people coming over for dinner. The meal required a bit of planning ahead because I would let it marinade for 24 hours, rather than the instructed overnight. I recently experimented with making it paleo-friendly and the first attempt came out much too sweet. I’ve since cut back on the maple syrup and did a few made a few more tweaks. I used to serve it with white rice (I know, I know, I had no idea then) and will every once in a while serve it with brown rice of which I’ve soaked for 24 hours and then rinsed thoroughly (it ferments it of sorts). More often than not, I’ll pulse cauliflower until it’s the consistency of rice in my food processor and then steam it in a skillet with chicken fat or I’ll serve it over roasted cauliflower. It’s fantastic! I hope you enjoy it as much as I do. 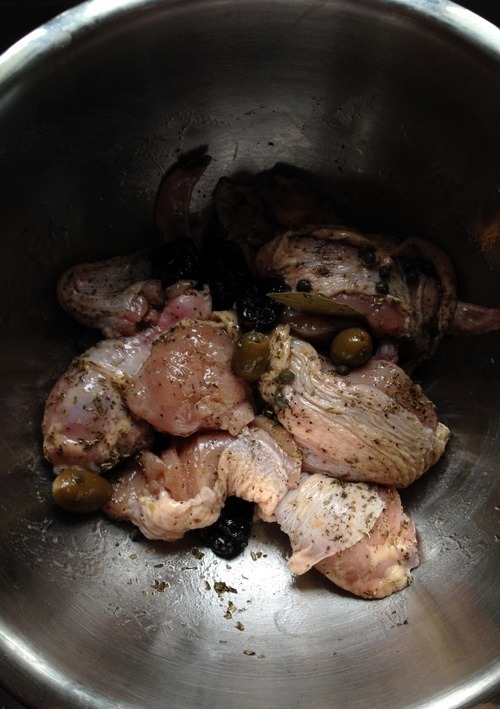 The night before: In a bowl, mix the chicken, garlic, oregano, S&P, red wine vinegar, olive oil, prunes, olives, capers and juice, and bay leaves. Cover and refrigerate for 24 hours. The next day: Preheat oven to 350 degrees Fahrenheit. Transfer chicken to a dutch oven and lay out chicken in a single layer, pour marinade juice around the chicken pieces. Pour maple syrup and white wine atop and place in the oven. Bake for 50 minutes to one hour, basting frequently, until juices run clear in the chicken, when cut. 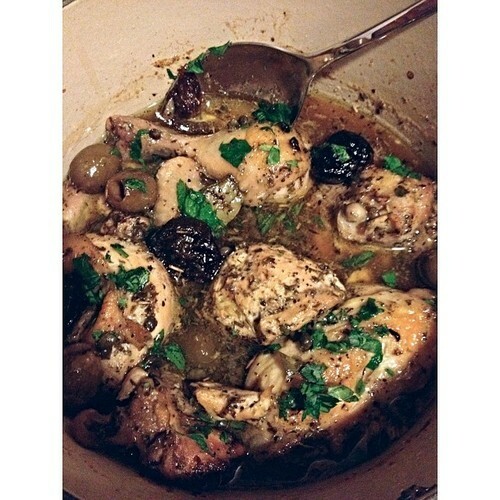 With a slotted spoon, transfer chicken, capers, prunes and olives to a plate. Pour juices into a sauceboat… or just do what I did and serve it all in one massive heap atop a bed of steamed cauliflower “rice”. Sprinkle the Italian parsley on top prior to serving. Ever have one of those nights where you set out to make something and end up with something completely different? Yea. Those nights. Welcome to my world. I had some time to kill yesterday and stopped by Bob’s Red Mill to see which spice I didn’t already have and possibly couldn’t live without. Now. I’m not usually one to buy blends. I typically like to make my own – I can control the extras they put in a lot better that way. But I was curious about the Chinese Five Spice – so I bought a small amount of it and figured I’d doctor something up later… with the chicken that I pulled out of the freezer that morning and put in the fridge and that didn’t defrost. Whoops. After that comedy of errors, I finally managed to defrost it (cold water baths are my friend) and dinner was made (although I was trying to make a different dish altogether) and I’m so very happy for my “mistake!” So, here’s Day 4 of my Whole30 Challenge dinner. Enjoy! In a skillet, over medium heat, heat chicken fat and add diced onions. Saute until translucent. In a separate bowl, mix the aminos, evoo, garlic, spice blend, ginger and apple cider vinegar. Set aside. Spread out onions so they evenly coat the pan and lay the chicken thighs on top. Pour the marinade over top and cover with a lid. Let the chicken steam until done, only turning once to ensure even coating of the marinade. Serve hot and spoon the juices on top when serving. Leftovers can be in the fridge for up to 7 days. Today marks the first day of the Whole30 Challenge. 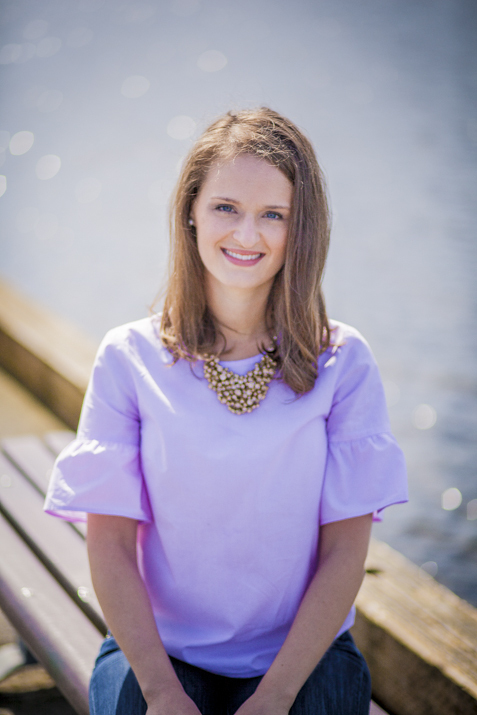 I’m super excited – eating paleo isn’t all that difficult for me… but I’ve been cheating and have been less compliant with the whole sugar thing (sugar is a toxin to the body). A 30 day detox is going to be wonderful! 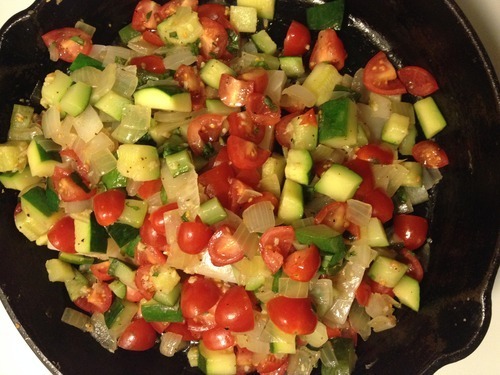 Heat olive oil in a skillet over medium heat and add onion, zucchini, and garlic and saute until soft. Stirring occasionally. Remove from heat and add tomatoes, basil, salt and pepper. Toss until evenly distributed. In an oven-safe dish (I used my cast iron skillet), lay out the halibut. Spoon the veggies over the top of the halibut and cook for about 15 minutes, or until the halibut is flakey. Serve hot, with veggies over-top. 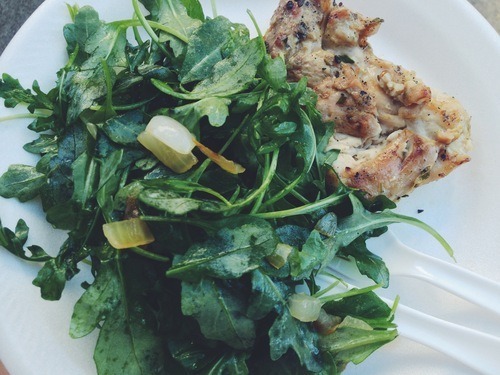 Arugula just might be the best leafy green out there…. beside baby spinach. It’s spicy, the texture is pleasant, and it’s spicy. So when a friend of mine celebrated his 30th birthday on Sunday with a BBQ and I knew there were going to be a few paleo (or modified) people there, arugula salad seemed to be the logical choice. And it’s vegan. For those friends who asked for this recipe, this one’s for you. But really, the rest of you should make this salad – it’s fabulous. The recipe is from my Mom so I take no claim to this one. But, really, it’s fabulous. Times ten. As for the chicken, well, here you go to my friends who asked. It was yummy. And I ate too much – but when you eat paleo, eating too much doesn’t really exist in your vocabulary. Saute onion over medium heat in half of the olive oil until translucent and just starting to caramelize. Add remaining olive oil and allow to sit for a minute longer and let the onions cool slightly, stirring so all of the oil is incorporated with the onions. Toss with the arugula in a large bowl and add sea salt, to taste. Serve while onions are still a bit warm. Mix the marinade together until blended. Toss all of the ingredients in a container (plastic ziploc, glass dish and cover with plastic wrap, or a plastic container) and allow to sit for about an hour in the fridge. Throw on the BBQ until juices run clear and the meat is cooked, about 4 minutes on each side. Unless you happen to have a Traeger (smoker BBQ) – let it sit a bit longer and that’s even better. 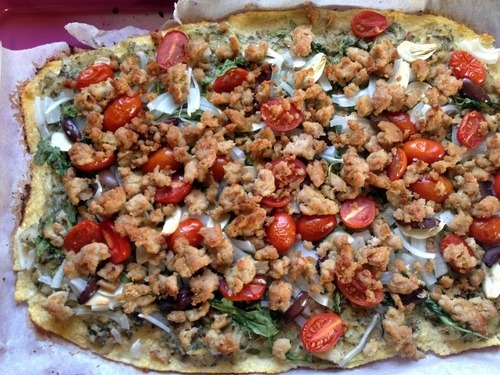 A few months ago, I tried to make paleo pizza dough but it was an abysmal failure. After scouring Pinterest (yes, I’m addicted to that as much as I am to running), I decided to modify a recipe and lose the cheese. Apparently you really do need cheese sometimes – it was barely palatable to say the least. This last week, the cravings for carbs and protein hit like none other thanks to my new attempts at CrossFit (I look like a flailing goat or some other highly pathetic animal but I plan on mastering it). Grocery shopping was not in the gameplan – it’s the end of the month which equals time to get creative, make mistakes (hopefully they taste good), and only get messy enough that I don’t destroy my kitchen…. oh, and not spend any money. The pizza was delicious and both paleo and non-paleo roommates enjoyed it thoroughly, with a request to make it again soon. If the non-paleo likes it, you know it’s good! Seriously. Whatever you have in your fridge. 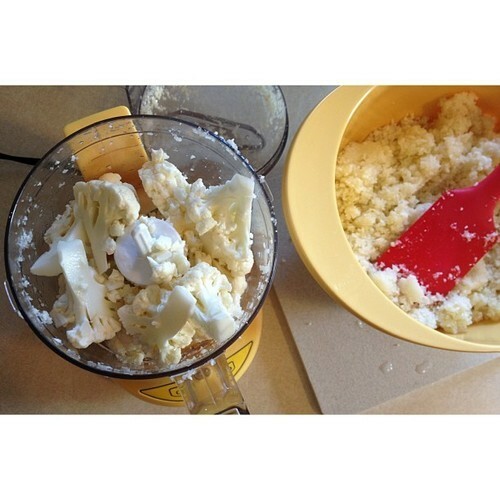 In a food processor, process small amounts of cauliflower until they are the size of small tapioca, scraping down the sides as needed. You may need to remove any large pieces and put them in the next batch so you don’t juice your cauliflower. Remove and dump into a bowl. Repeat until all cauliflower has been riced. Mix in remaining ingredients (you could put some herbs in for some extra something). Line a pan with parchment paper and pat out a crust. Precook for 15 minutes, or until the sides of the crust are starting to turn golden brown. Remove from the oven and place toppings on. Place back in oven for 15 min, or until the bottom of the crust is a light golden brown. Let cool for a few minutes, cut and serve! Note: This is an"eat with fork and knife" crust – I haven’t perfected the crunchy crust quite yet but am working on it! I told my fiance that I was making tomato marinara for dinner. His first reaction was that I wasn’t allowed to have tomatoes (they’re a nightshade and are off the list) and then he began reminding me that I was trying to get better (he’s been very very supportive during all of this – I’m one lucky lady). I told him that it wasn’t tomatoes… it was beets and pumpkin puree. I think I heard a pin drop. He might have thought he’d seen a pig fly outside. 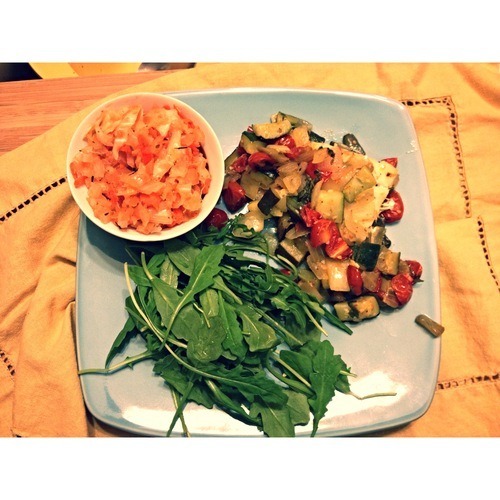 And then he shrugged his shoulders and said, “You’re a good cook, I trust you.” Did I mention that I was a lucky lady? He’s willing to take culinary leaps of faith right alongside me. Much to my surprise… and I think even more his, it tasted like marinara sauce. And it looked like marinara sauce that had been slow-cooked for hours on end. I was so excited! Combine this with my gluten-free dairy-free spaetzl (recipe for that coming soon) and my life just might be complete. Or pretty close to being complete. A sprinkling of nutritional yeast would, in fact, make it complete. Just one note, the onion, which reads finely chopped, needs to be finely chopped. Otherwise you’ll get fuchsia onions like I did during my first attempt. Also, I added a splash of plum balsamic vinegar (you can find it at your local vinegar and oil specialty store – I highly suggest picking up some vinegars you like as store-bought salad dressings are off the foods list) and a splash or two of white wine vinegar to brighten things up a bit. 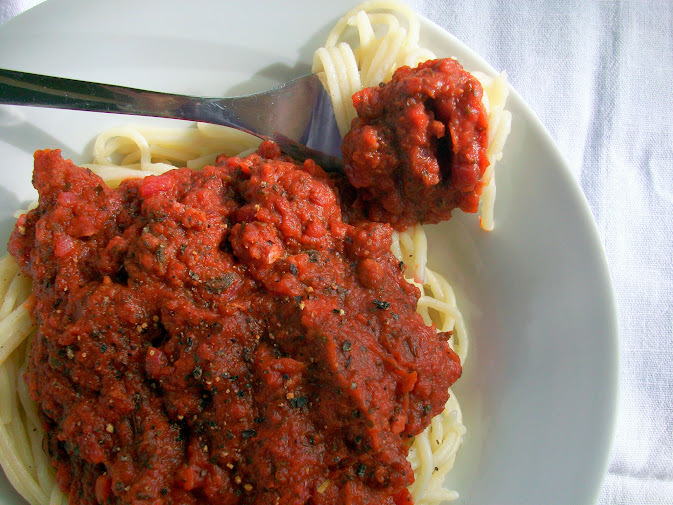 It’s a marinara – play around with it! Saute onions and garlic over medium heat in a dutch oven until onions are translucent in a medium dutch oven or large skillet. Add balsamic vinegar and let simmer for about 5 minutes. Add the stock and stir. Add the spices and stir. Let simmer for about 30 minutes. Check the balance of the spices and adjust as necessary. I dare your family, friends, and picky eaters to tell the difference!